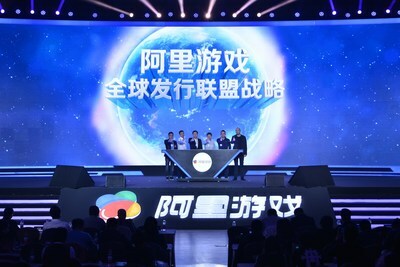 - Tie-up with global players to establish the "Global Strategic Alliance of Game Distribution"
MOSCOW, March 16, 2017 /PRNewswire/ -- Alibaba Games, Alibaba Mobile Business Group officially announces Alibaba Game's plan to enter the game distribution industry and discloses the investment of 1 billion RMB to the Intellectual Property mobile gaming ecosystem. Senior management of Alibaba Digital Media & Entertainment Group launches the "Global Strategic Alliance of Game Distribution"
At the press conference in Beijing on 16th March, Simon Shi, President Alibaba Games, Alibaba Digital Media & Entertainment Group, announced the official partnership of the company with Mail.ru Group, TFJoy, Efun and ONEMT to establish the "Global Strategic Alliance of Game Distribution". The association aims at bridging the mobile games distribution between China and Russia, Europe, Japan, Middle East and the US and provide upgraded gaming experience to local users. Alibaba Games also upgrades the traffic distribution by integrating the traffic in both the iOS and Android platforms. The company is using big data technology for accurate distribution and precise recommendation system to each user. More previously in Russia UCWeb, an Alibaba Digital Media & Entertainment Group company disclosed its partnership with Mail.ru Group and the plan to expand in mobile games collaboration. Now with the establishment of the "Global Strategic Alliance of Game Distribution" that Alibaba Digital Media & Entertainment is seeing more in-depth cooperation with the local giant in Russia market. On behalf of the Alibaba Digital Media & Entertainment Group, Xiaopeng HE, President Alibaba Mobile Business Group said: "To maximize the value of Game Intellectual Property, Alibaba Digital Media & Entertainment Group will integrate the resources from UCWeb, Youku, Alibaba Pictures, Alibaba Literature to build a circulation chain for the IP derivatives. UCWeb with its massive traffic entry globally will play a significant role in the distribution of Alibaba Games". According to Simon Shi, "the development in mobile games market in the 5 biggest international market - Europe and the United States, Japan and South Korea, the Middle East, Latin America and Southeast Asia is uneven. European, American, Japanese and South Korean markets are already considered mature markets, while the Middle East in the past two years is seeing rapid development, and Latin America and Southeast Asia as the emerging markets show very high potential in the mobile games consumption. "We are doing very well in emerging markets like India and Indonesia already", says Shi. Data shows that in 2016 the Indian mobile Internet population reached 370 million, by the end of 2017 it is expected to reach 500 million. As of February 2017, the Indonesian mobile Internet population has reached 100 million. In these emerging markets, the company has already built its powerful content and game distribution network. UC Browser as the flagship product of Alibaba Mobile Business Group has hit the No.1 place in market share. And the app distribution platform - 9Apps is the leading 3rd party app store in India and Indonesia. UCWeb Inc. (UCWeb), a business within Alibaba Mobile Business Group, is a leading provider of mobile internet software and services. Since the inception in 2004, UCWeb's mission has been to provide better mobile internet experience to people around the world. The international product portfolio of UCWeb includes UC Browser (mobile browsing service), UC News (content distributor), 9Apps (Android app store), and UC Union (mobile traffic and monetization platform). UC Browser is one of the world's top 3 mobile browsers (as per StatCounter). UC Browser has reached 420 million Monthly Active Users as of August 2016, while 9Apps has clocked over 250 million. Additional information about UCWeb and its products can be found at www.ucweb.com.